If you are a devoted viewer of local public-access television, especially during the mid-to late 1990s, you most likely will remember Shannon Kringen’s show “Goddess Kring.” The Capitol Hill resident, as her alter ego, would often be dressed in nothing but face and body paint and doing spoken poetry, showing some of her shoe paintings or expressing verbally how she feels, sometimes set with a hypnotic musical ambience in the background and psychoactive audio and visual effects. Now, Kringen is showing off her photography work in some art shows around Seattle, and she has synchronicity to thank. Through April 4, her photography is hanging on the walls at the Pel’Meni Dumpling Tzar, 3516 Fremont Ave. N., in Fremont as part of the Fremont Art Walk. Another showing is at The Green Door Studio, 1520 11th Ave., on Capitol Hill. These shows, including a recent show at Ballard’s Cupcake Royale, all happened within a week’s time. Her Ballard show happened when an Antioch University classmate, who happens to work at Cupcake Royele, didn’t have an artist scheduled for February. That then led to the show at Pel’Meni. 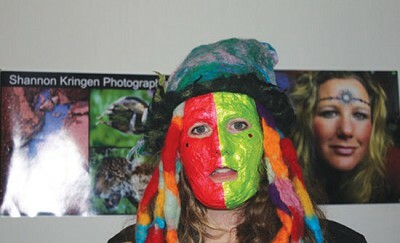 Kringen had displayed her photos briefly years ago in art shows. Peter Storey, who runs Green Door Studio, had watched Kringen’s show on SCAN-TV (now Seattle Community Media) and had seen her photos on Facebook. “I found it to be creatively very free — almost naively so. It was refreshing,” Storey said of Kringen’s photography style. Besides photography and video, Kringen has been a figure model for schools, private art studios and artists for 20 years. She also does painting on shoes and abstract canvases, spoken-word poetry, improvisational piano and silk screening. She also recently took up felting and acting. 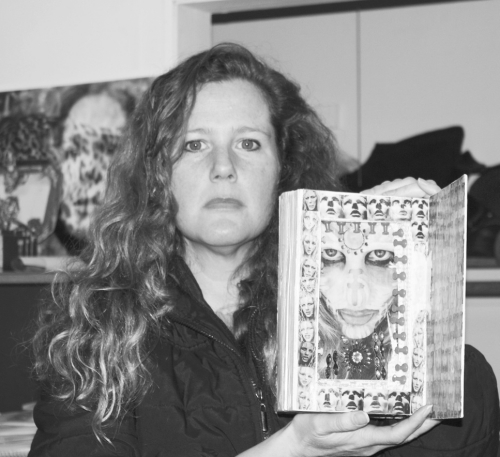 Kringen sees her art as a container to put all her ideas into and make her feel organized and calm. But one of her creations that stand out in people’s minds is her long-running, public-access show, “Goddess Kring,” just renewed for its 15th season. “Kring” started almost by accident. One day, someone saw her walking by wearing one of her painted shoe creations, and out of the blue, she was encouraged to do public access. Later on, she went to the now-defunct SCAN-TV studios with her boyfriend at the time and became fascinated with the production process. After they broke up, she would film herself talking into the camera to make herself feel better. She then began submitting these recordings and found herself getting instant feedback, more than she ever anticipated. “I got hooked,” Kringen said. With her TV show, modeling, painting and now photography shows, Kringen’s long-term goal is to use creativity toward something more altruistic. She said she wants to continue to create, but also incorporate social justice and healing into her work (her self-designed degree program at Antioch University is geared toward this). Plans include possibly writing a book with her words and art and even inspirational lectures with slideshows of her art.